Silhouette Blades...Which Blade to Use When, Why, How? I get a lot of questions about which Silhouette CAMEO Blade is best to use...there's not one standard answer as it will all depend on the type of material you're cutting, the design, and the Silhouette machine you're using. Personal preference also comes into play! The standard black Silhouette Ratchet Blade can be used to cut a splice in any of the CAMEO machines, the Portrait and the Curio. To adjust the regualar Silhouette blade between a depth of 1-10 (10 being the deepest cut for thicker materials), use the gray ratchet that came with the blade or the built in ratchet on the actual Silhouette machine. Just insert the tip of the blade and twist. When inserted into the machine, the fin on the blade's housing should be pointing to 6 o'clock. With the exception of fabric, the ratchet blade is used to cut all materials, ranging from paper to vinyl to stencil material, etc in the CAMEO and Portrait. It is used on the same materials in the CURIO. The blue Silhouette Fabric Blade can be used to cut fabric in any of the CAMEO models, the Portrait and the Curio. To adjust the blade, use the gray ratchet that came with the blade or the built in ratchet on the actual Silhouette machine. Just insert the tip of the blade and twist. When inserted and locked into the machine, the fin on the blade's housing should be pointing to 6 o'clock. The blue fabric blade should only be used to cut fabric. The fabric blade is exactly the same as the black ratchet blade with the exception of the casing. It is simply in a blue housing so it can be easily distinguished and used exclusively for fabric. 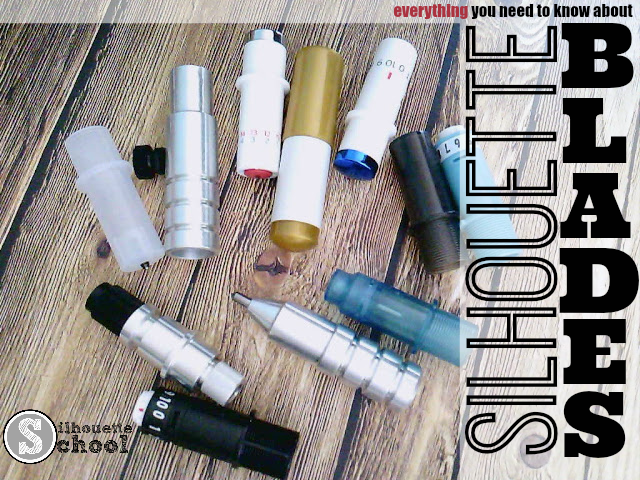 The Silhouette Sketch pens come in a variety of colors. They fit in the blade housing on the CAMEO machines, the Portrait and the Curio. The sketch pens will draw just like the ratchet blade cuts - an outline. To 'color in' a sketched design, additional steps are needed. Check out this Silhouette School tutorial on filling in sketched designs for details. The Silhouette Deep Cut Blade is one of the newer Silhouette blades. According to the manufacturer, it should be used with the Silhouette Curio. However, I prefer to use it in the CAMEO (or Portrait). Please note using it against manufacturer recommendations may void your warranty. The Deep Cut Blade has two rows of numbers to adjust the blade depth from 1-20. The blade can be adjusted using your hand - so no ratchet is necessary. If any part of the blue is exposed on the tip of the blade, that indicates the line is matching up with the blue row of numbers. There is no fin on the Deep Cut Blade so it does not matter how the blade is inserted and locked into the machine. The Silhouette Premium Blade is one of the newer Silhouette blades and can be used to cut a splice in any of the CAMEO machines, the Portrait and the Curio. The Premium blade is made of a material that lasts up to 3x longer than a standard Silhouette ratchet blade. To adjust the blade between a depth of 1-10 (10 being the deepest cut for thicker materials), turn the tip of the blade with your hand. There is no fin on the Premium Blade so it does not matter how the blade is inserted and locked into the machine. The transparent blue Stippling/Etching Tip is for use in the Silhouette Curio. The blade depth does not need to be, nor can it be, adjusted. There is also no fin on the blade. Simply place it into one of the two housing compartments on the Silhouette Curio and lock it into place. When the stippling tool is selected, the tip will perform an up and down motion producing a dot-like pattern. When the etching tool is selected, the tip will drag along the material producing an etch. Like the Silhouette Sketch pens, it does not 'fill' in the design unless specially instructed to do so by the user in Silhouette Studio. The transparent black Wide Embossing Tip is for use in the Silhouette Curio machine. The blade depth does not need to be, nor can it be, adjusted. To produce a better emboss, score first with the ratchet blade on a 0. The transparent white Fine Embossing Tip is for use in the Silhouette Curio machine. The blade depth does not need to be, nor can it be, adjusted. 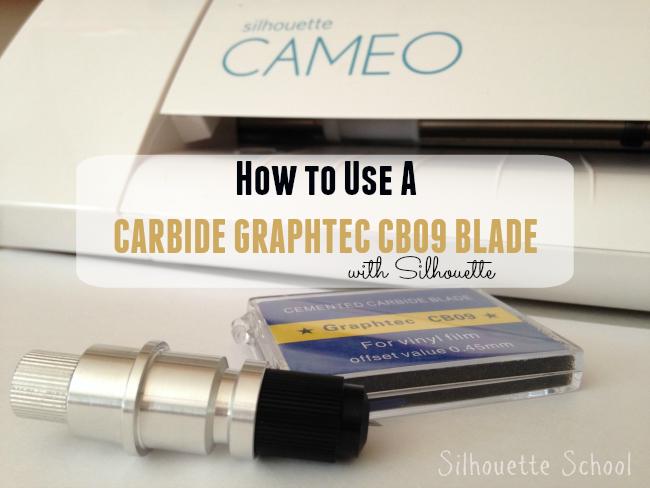 The CB09 Blade or Graphtec blade is an off-brand blade that can be used with the Silhouette machines. It does not slide into the housing compartment very easily so make sure you check out this Silhouette School tutorial and demo on how to use the CB09 blade with Silhouette CAMEO. The CB09 is very different from the Silhouette-brand blades in that it needs to be assembled and the actual blade can be switched out and replaced. You must buy the housing and the blades in order to use it. The blades themselves are actually three different angles and are different than the ratchet blades so they splice through the vinyl at a different angle making it much easier to cut intricate cuts. I much prefer this blade for vinyl especially. The one drawback is that there are no markings on the blade so there is definitely some trial and error when it comes to getting the blade the right depth. Once you find the perfect blade depth, my suggestion would be NOT to adjust it at all and keep this blade exclusive for vinyl. The Amy Chomas Etching and Engraving Tip can be used in the CAMEO, CURIO, and Portrait. Simply slide the tip into the blade housing and lock it into place. While the blade etches and engraves well the biggest drawback comes from the lack of download force provided from the Silhouette machine therefore a deep/dark etch or engraving is extremely difficult to achieve. on the CAMEO, Portrait or Curio. Before placing it into the Silhouette machine, slide a pen into the holder and tighten the black screw to secure the pen. Place the entire holder with pen into the Silhouette blade housing. You may need to adjust the pen height. It is at the correct height when a popsicle stick can be slid between the tip of the pen and the paper base of the machine. The Amy Chomas Marker Holder is an off-brand attachment that can be slipped into the blade housing on the CAMEO, Portrait or Curio. Before placing it into the Silhouette machine, slide a marker into the holder and tighten the black screw to secure the pen. Place the entire holder with marker into the Silhouette blade housing. You may need to adjust the marker height. It is at the correct height when a popsicle stick can be slid between the tip of the marker and the paper base of the machine. Thanks for all the great suggestions. You really helped me learn to use my Silhouette. Your Blog is fantastic! Thanks very much, I need as much information as I can get and this helps bunches. I wonder if anyone can tell me about the embossing tool. I had hoped to making greeting cards for the blind. I see no reason that I cannot if I use the PIXScan to load the alphabet. Any information would be greatly appreciated. Seriously - thank you so much! You totally rock. Muchas gracias por esta explicación. Dios la bendiga. Thank you for all your hard work, taking the time out to help us newbies and all your helpful information! I use my silhouette for making stencils and for stickers. Thank you so much for all the tips and ebooks. Can the Amy Chomas Blade be used in the Portrait? You mentioned it in the text but not in the video. And would this be good for scoring? I just want a light score mark to show where something needs to be bent. Thank you so much!!! Why can't the CB09 blade be used in the Cameo 3? It works perfectly in mine.